VIET NAM - At the end of July and according to the General Statistics Office, Vietnam currently has about 26.76 million pigs on the farms (up 2.5 to 3.0 per cent from last year at this time). The hog market production reached 2.05 million tonnes of pork in the first 6 months of 2015 which is an increase of 3.9 per cent as compared to the same period in 2014, write Ron Lane, Business Director for Asia Pacific and Meggie Vo, Genesus Marketing Representative in Vietnam. The Ministry of Agriculture forecasts an increase in output this year of 2.4 per cent to 3.37 million tonnes. However, according to the Department of Animal Husbandry, Vietnam imported 2,432 tonnes of pork during the first half of this year (a year on year increase of 47 per cent ). Imports have now surged since the Vietnam EU Free Trade Agreement (EVFTA) was recently endorsed by both areas. Frozen pork will have zero tariffs in seven (7) years. This FTA has allowed 106 eligible firms to import various kinds of meat. As well, about 100 EU exporters have been given certificates to export meat to Vietnam. These imports are putting pressure onto the growth of local producers. The Department of Agriculture is initiating some restructuring to the swine industry in order to offset the strong growth in imports. Cao Duc Phat, the Minister of Agriculture and Rural Development recently stated that “This restructuring also includes changing the perspective and increasing competitiveness in terms of quality and value” ( in the past 3 years, the volume of frozen pork imported directly from the EU has increased by 7.5 times to 6, 100 tonnes). Although the Vietnam meat industry has developed well over the past few years, there are current restraints that cause the livestock industry some major challenges or barriers. Land accumulation is currently one of the important stages to change. The current structure and mode of agriculture, must overcome the current fragmentation that is produced. Nguyen Duc Thanh from the Agro Forestry Fisheries Investigation (from the General Statistics Office) said in 2014, of a total surveyed 41,316 households, the number of small (less than 10 pigs/household) accounted for 86.4 per cent (and whereas private households ultra-small size (1-4 pigs/household) accounted for 71.6 per cent of all pig farms), but only produce 43.2 per cent of the total quantity of pork produced. The total pork carcass yield from the domestic production of Vietnam livestock industry was around 2.628 million tonnes in 2014. This will lead to more pork imports from abroad as more pork is consumed and as the general population demands more meat protein. Vietnam’s livestock industry has low productivity, very high production costs and quite small scale production units. Furthermore, the Vietnam Institute for Economic and Policy Research mentioned that domestic livestock production is unsustainable, non-competitive and vulnerable and would be at a disadvantage when the new Trans-Pacific Partnership (TPP) and the Asean Economic Community (AEC) are engaged. Again, the large number of small-scale farms, the dependence on imported breeding stock, devastating diseases, technical limitations and poor slaughtering facilities, including basic hygiene will put Vietnam’s market pig producers behind and a continued surge in imports will continue. The price of a market pig in the North has the common average price of around 48,000 to 52,000 VND/kg ($ 2.17USD/kg-$ 0.99USD/lb to $ 2.35USD/kg-$ 1.07USD/lb. ); whereas in the South region, the average price range is around 45,000 to 50,000VND/kg ($ 2.04USD/kg-$0.92USD/lb to $ 2.26USD/kg-$ 1.03USD/lb). This is a reverse from a few months ago. With the recent surge in prices in China, Chinese buyers have been actively buying Vietnamese pigs in the North. This, in turn, has driven the price in the northern region to be higher than the southern region. Some recent pork prices were for ham and bacon, from 75,000 to 85,000VND/kg ($ 3.39USD/kg-$ 1.54USD/lb to $ 3.84USD/kg-1.74USD/lb. ); pork tenderloin from 85,000 to 95,000VND/kg ($ 3.84USD/kg-$ 1.74USD/lb. to $ 4.30USD/kg-$ 1.95USD/lb. ); ribs from 120,000-130,000VND/kg (5.43USD/kg-$ 2.46USD/lb. 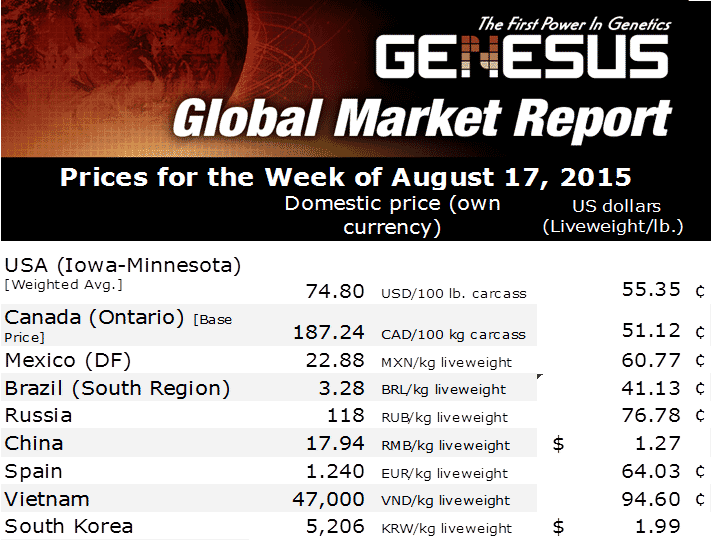 to $ 5.88USD/kg-$2.67USD/lb.). In the north, some prices for pork were; tenderloin at 95,000VND/kg ($ 4.30USD/kg-$ 1.95USD/lb); bacon at 85,000VND/kg ($ 3.84USD/kg-1.74USD/lb.) and the price of pork meat at 80,000 VND/kg ($ 3.62USD/kg-$ 1.64USD/lb.). Furthermore, the price in the south has dropped as many pig farm owners in Dong Nai area (near HCM) are currently selling market pigs at 43,500 VND/kg, down about 2,000VND /kg as compared to earlier months. This is mainly due to many farms were using the banned substance salbutamol (Beta - agonists to produce lean meat). Local consumption decreased and this, in turn, lowered the selling price. However, the purchase by Chinese traders is keeping the price in the pork market relatively stable. Recent reports indicate that there are currently 240 breeding stock farms (with about 59, 280 breeding sows) in the Country. Large Companies, such as CP and Japfa have a large portion with 21,172 sows on 79 facilities. The total farms can produce about 230,000 to 240,000 breeding gilts per year. This meets about 25 to 30 per cent of the demand and to develop the industry. The balance of the sows comes from local production with no basis of origin. Production capacity and utilization of Swine AI now accounts for 42.0 per cent of the sows inseminated directly. Target development in the coming years is to increase the proportion of artificial insemination for sows from 43 to 44 per cent in 2015 to 60 per cent in 2020. The major breeds in the country will be the Duroc, Pietrain, Landrace, Yorkshire and Mong Cai. Another target is to increase the proportions of foreign breed sows and hybrid sows on local swine farms from 30.4 per cent in 2015 to 34.1 per cent of the national sow herd by 2020. Reproductive performance of hybrid sows herd average from 18 to 20 weaned per sow per year to 21.5 to 23.5 pigs per sow per year in 2020. The Consumer Price Index (CPI) in July recorded a lower increase, 0.13 per cent compared to June when there were no price hikes in major products. The CPI rose 0.68 per cent year over year. For the past 7 months, the CPI rose an average of 0.86 per cent.